As if you needed another reason to attend Lime Rock Park's Historic Festival 32 over Labor Day weekend, Murray Smith, chairman of the event, has confirmed which cars from Ralph Lauren’s private collection will be displayed over the four-day Labor Day weekend that comprises historic and vintage racing competition surrounding a concours d’ elegance. Mr. Lauren’s private collection is spectacular – and it is a very rare event when cars of his are made available to the public at large. 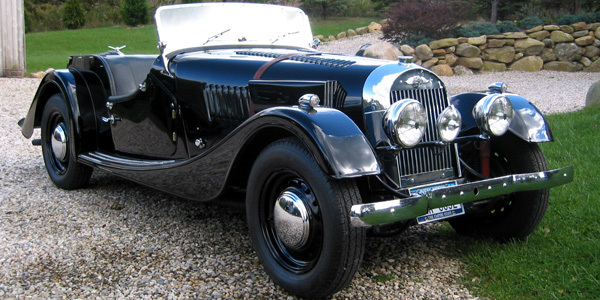 Ralph Lauren' first car was a Morgan. This perfect example of a Morgan Flat Rad (radiator) is one of just 750 built and was purchased by Lauren in 1986. The Ferrari 250 LM was introduced at the Paris Auto Show in October, 1963 to great fanfare. In the LM, Pinninfarina presented a great case-study in how form following function can be beautiful. Unable to obtain the necessary homologation for GT racing, the 250 LM raced in the prototype category; a 250LM won Le Mans in 1965. Between 1965 and 1968, chassis 6321 – 31 of 32 built – was campaigned extensively and successfully in 19 Australian racing events, winning 13. Among those victories was the Surfers Paradise 12 hours in 1966, co-driven by Andy Buchanan and a young driver just beginning a brilliant career... Jackie Stewart. When it comes to performance, the Jaguar XKSS was in a league of its own, likely the world’s quickest and fastest production car in 1957. The XKSS was a road-going version of Jaguar's incredibly successful D-Type race car; factory run D-Types won Le Mans in 1955, 1956 and 1957 while privateer D-Types won many other races, too. Jaguar was convinced by Briggs Cunningham that it could win in American SCCA production car racing, where the rules required 50 street-legal cars be built. So Jaguar changed the model number of 25 XKDs to XKSS, with 25 more to be built to meet the minimum 50. Turn signals, a larger windshield, bumpers and the like were installed. Unchanged from the competition D-Type was the engine (the 250-bhp dry-sump 3.4-liter straight-6), the rack-and-pinion steering and disc brakes. As the conversion work began on the first 25 XKDs, a fire at the Brown's Lane factory in February 1957 destroyed nine of the cars – and all of the tooling. The 16 surviving XKSS were converted and delivered. Later, two original D-Types were returned to Jaguar and converted to XKSS specifications. One of those, XKD533, is the Ralph Lauren car, changed to an XKSS at the factory in 1958 for Pierre Chemin of France. I had the pleasure to see the 250 race in Australia several times. It is the car I have coveted since 1965! Sorry I missed seeing it in 2014.